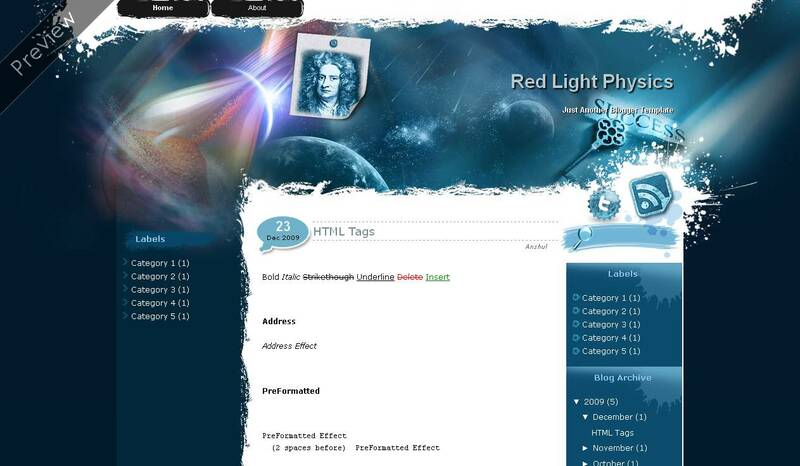 Red Light (Physics) blogger template is a three column blogger template with post section to center and one sidebar to left and right both.The theme is designed by templatelite and converted by me to blogger.The template contains very high quality images with many built in widgets inside it.Top menu page links are ready for you.Search box is ready inside your blog with rss button to its top and also an follow on twitter widget.Just click on the download link and enjoy using it.Seo for title has already been done.If you want to have psd files for it you can buy them at wordpress download link.The theme is specially designed for chethstudios an design blog. Other blogger templates you may like are Masugid and Mild Cotton. Nice shearing for beautiful blogger template. Good work. Thanks. @gaurav as i dont think there space for facebook widget.But u can have facebook widget in place of twitter.Just take twitter image and make facebook image like it of your own and replace that image link in blogger html with facebook image link.And also the twitter url with facebook url.As this template is based on images made in photoshop so need to know about designing as well as blogger codes. Hi I really like your conversion of this theme, would it be difficult to convert to a 2 column theme removing the left column to give more whitespace for the blog ? @chris ya as first to make psd for it and again do coding so difficult to do in this.